Cordless vacuums have come a long way in the last few years. Once plagued by short battery lives and poor suction, today’s cordless vacuums have evolved into practical and powerful machines that can give corded models a run for their money. Of course, not all cordless vacuums have reached this stage of development. If you’re looking for a lightweight, powerful and well-designed cordless vacuum, it’s important to research your prospective pick before making a purchase. There are a lot of great cordless models that do a great job on dust and dirt, but deliver lackluster results on pet hair. In these reviews, we’ll look at our favorite vacuums that score high marks not only in all-around quality and performance, but also boast superior pet hair removal. Hoover is famous for producing great vacuums at a reasonable price, and their Hoover Platinum LiNX upright is one of their most popular models. It consistently earns high marks on consumer tests, and the majority of customers on Amazon give the LiNX a 5-star rating. This upright, cordless vacuum is an adaptation of the equally well-regarded Hoover LiNX handheld vac. Unlike its predecessor, it’s not billed as a “pet vacuum.” Nonetheless, the upright version still delivers excellent performance when sucking up pet hair. The LiNX features Hoover’s WindTunnel technology, a patented three-channel suction system designed to remove more deeply embedded dirt from the carpet, as well as a motorized brush roll. There’s a switch to turn the brushroll on and off for switching between carpet and bare floors. A rechargeable lithium ion battery powers the LiNX, especially manufactured in order to prevent the loss of suction power as the charge winds down. There’s also a battery charge indicator to let you know the amount of battery life left. When the battery is depleted, simply pop it out and charge in the included charger. The base of the LiNX is 11 inches—a wider than average size for a stick vacuum that makes for a larger cleaning path. Bristles located on the edge of the head allow you to vacuum closer to walls and furniture. The low profile head and full recline of the LiNX allow you to get under furniture and into other tight places. Hoover’s WindTunnel tech, combined with the powered brush roll, does a great job at removing deeply embedded pet hairs, dust, and dander from deep within your carpets. The LiNX also performs well on hardwood and tile, with enough powerful suction to remove fine particles from the tiny crevices of hard floors. The on/off switch for the brushroll allows for seamless transition between floor types. Reviewers also loved the design of the vacuum—the lightweight and cordless body makes the LiNX very easy to move around the home, or carry up and down staircases. Meanwhile, the wide, swiveling head of this vacuum makes for quicker cleaning around the home, and the full recline and low profile of the LiNX allow for quick access to tight spots under furniture. Intuitive operation is another strength of the LiNX—it’s easy to assemble, easy to use, and easy to maintain. The battery indicator is a rare but useful feature among cordless vacuums, and the bottom-opening dust cup makes it easy to empty the canister when it’s full. The washable foam filter is also easy to clean—it can be brushed off for a quick refresh or rinsed and dried to get the vacuum running like new. One of the biggest limitations of the Hoover LiNX is its inability to clean most above-floor surfaces. The floor head of the LiNX isn’t removable, and there are no attachments or extensions for cleaning upholstery, shelving, ceilings, etc. The wide head also makes it difficult to navigate on the steps, making the LiNX more or less limited to floor cleaning. If you’re looking for a cordless vacuum that can take on any surface in your home, you should check out our other two picks instead. Some customers were frustrated by the short battery life of the LiNX. This is a common complaint among all cordless models, however, and the LiNX is actually above average compared to the competition. The battery life will depend on how much you use the powered brush roll. Hoover doesn’t give any official number for the length of each charge, but reviewers report that the LiNX runs for about 15 minutes with the brush roll on, and 30 minute with the roller turned off. The Hoover LiNX is a fan favorite for its solid balance of price and performance. Lightweight, easy to maintain, and simple to use, it’s a good vacuum for quick and easy floor cleaning, whether your home has carpet, hard floors, or a mixture of both. Though it’s not without its limitations, the LiNX has a lot to offer for a low cost. It earns high reviews among pet owners, who say the simple operation, intuitive design, and strong pet hair performance has made cleaning up after pets a breeze. 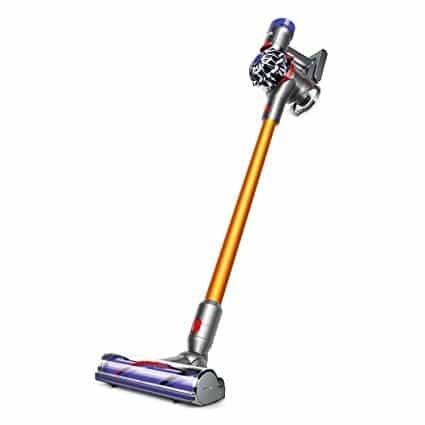 Dyson’s V8 line is known for top tier performance among cordless vacuums, and the V8 Absolute is their newest and most feature-heavy model. The cordless, bagless V8 Absolute is powered by a V8 motor (as you may have guessed) and is the only member of the V8 line with whole machine HEPA filtration. It weighs about 5 pounds, with a center of balance near the dust canister that makes it easy to vacuum any spot from the floor to the ceiling. The Absolute features a trigger control to prolong the life of the battery, as well as a boosted power setting for enhanced suction. One charge lasts about 20 minutes in normal mode, and about 6 minutes at maximum power. The unit is charged via a wall mounted holder, which also doubles as a convenient storage spot. Dyson includes two different attachable floor heads alongside the V8. There’s the direct-drive cleaner head, with a motorized designed for deep cleaning carpets. For cleaning hard floors, there’s the soft roller cleaner head that picks up both fine dirt and dust and large debris. In addition to the two floor heads, there’s an array of accessories that accompany the Absolute. Pet owners will enjoy the mini motorized tool, an attachment with a small powered brush roll for deep cleaning upholstery. There’s also a crevice tool, a mini dusting brush, and a “combination tool” that features a retractable crevice tool within a dusting brush. You would be hard-pressed to find any cordless vacuum with more cleaning power than the V8 Absolute. The V8 motor generates a great deal of suction (enough to rival many full-size corded vacuums) and the two different floor heads work magnificently on their respective floor types. The direct-driver head drives its bristles deep into the carpet, adding 75% more power to the original V8 vacuums. Many reviewers reported that the Absolute unearthed a great deal of dust and dirt that their previous vacuum had missed. Meanwhile, the hard floor head uses a roller with soft fabric in the place of the traditional bristles. This protects the delicate surface of hardwood floors, simultaneously removing more fine dust with the fabric and grabbing large particles with the suction. The V8 Absolute is the most versatile cordless vacuum we’ve come across, equipped to handle every surface in the home. The balanced design and extension wand allow for easy above-floor cleaning, from high shelving to ceiling fans. Removing the wand converts the Absolute into a traditional hand vacuum, and the mini-brush roll attachment can be added for deep cleaning upholstery. Pet hair proves no trouble for any of the Absolute’s attachments or floor heads—the powerful suction easily removes pet hair and dander from any surface. Pet owners particularly liked the mini-motorized attachment for removing fur from upholstery, pet beds, car interiors, and other fabric surfaces. 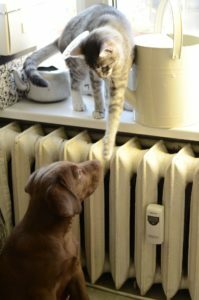 Finally, pet owners will allergies will appreciate whole machine HEPA filtration system. The filter of the Dyson traps dust, dander and other allergens, and keeps them from returning into the air in your home. The biggest setback for the V8 Absolute is the price—the price tag of this stick vacuum tops that of many full-size models. Furthermore, the limited battery life of the Absolute doesn’t provide enough time to clean your whole home. This means that you will need to keep your corded vacuum for the bulk of your vacuuming, with the Absolute functioning as a secondary tool for quick cleanup jobs. Many customers may be reluctant to invest that cost in a secondary vacuum. 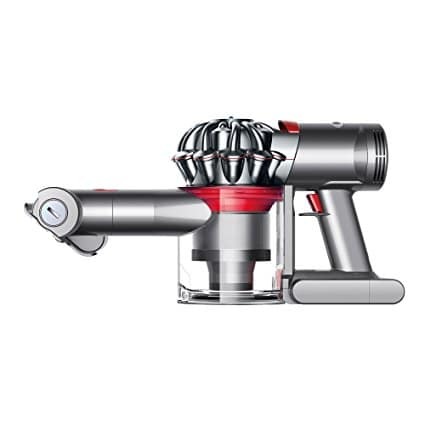 If you want the V8 quality, but the Absolute falls outside your budget, check out the original Dyson V8. It lacks the bells and whistles of the Absolute, but comes at a fraction of the cost. If top tier performance is your goal, you can’t do better than the Dyson V8 Absolute. This cordless powerhouse is equipped to take on pet hair, dirt, dust, and large debris in any corner of the home. The Absolute comes fully loaded with an array of great accessories and features, like two different floor heads, a mini motorized upholstery tool, and full machine HEPA filtration. The price tag is steep, but consistently high ratings from customers and experts show that the V8 Absolute is worth it. Dyson’s new V7 Trigger is the successor to their V6 Trigger, which we’ve loved for years. That model was getting a bit behind the times, though, since they kept upgrading the stick models without touching the Trigger handheld. The V7 easily earns its place as our top cordless hand vac. It’s powerful, long-lasting and reliable. We especially like this newer Trigger because it includes a motorized tool as standard. You used to have to buy that separately! Thanks to all the attachments, and the sheer suction power, this is easily the most versatile hand vac we’ve used. And it’s perfect for those with pet allergies, too! While it’s not HEPA-certified, it does a great job at filtering dust particles out of your air and emptying neatly. It’s the most powerful cordless hand vacuum on the market, aside from using the full Dyson V8 in handheld mode. The other dedicated hand vacuums don’t even come close to the V7 Trigger! It’s extremely versatile. The V7 Trigger comes with a combination brush and crevice tool, like the older V6. We love this arrangement, because you just slide between the two modes. You don’t have to keep track of a bunch of detachable tools. There’s also a motorized brush head, which you can use on upholstery and carpeted surfaces. We think it’s perfect for cat furniture, dog beds, or car seats. It doesn’t tangle, and it does an excellent job scrubbing. It comes standard, too, which wasn’t true of the last Trigger. It’s light and ergonomic. The center of gravity is further back than most handhelds, and the whole thing is less than 4 pounds all told. The best thing about this one, compared to the older model, is the improved battery life. While you may or may not notice the increased suction power, you definitely notice the battery life. This one lasts 1/3 longer than the V6. It’s finally got enough runtime to clean the whole car thoroughly! You get as much runtime as many cordless models that are far less powerful. It’s a lot less messy to empty than other hand vac’s. The Trigger design has a trap-door in the bottom of the dust compartment, so you can just hold it over the trash and press a button. It’s very simple, and you can hold it away from you to keep from inhaling any stray particles over the trash can. The filter is washable, and should last the life of the vacuum. We also love the screen that’s fitted over the filters. It stops pet hair and larger debris from clogging the filter. There’s a rubber band which cleans off the screen every time you empty the dust compartment, too! Triggers have a good track record for lasting a few years before they show any signs of age. It’s loud. That’s our main complaint with all Dyson’s. It’s pretty pricey. This costs as much as some full-size vacuums. It’s the best handheld model we’ve found for controlling pet allergens, but it’s not technically HEPA certified. Overall, the Hoover Air is a great buy, and this cordless handheld vacuum will be an asset to any home with pets. This lightweight yet powerful hand vac uses some of the latest tech available to take on large and small debris on any surface. The Powered Turbo Tool attachment is a pet owner favorite, quickly and effectively removing pet hair from upholstery, car interiors and stairs. With consistently high ratings and glowing reviews, the Hoover Air is a purchase you can make with confidence! Which Battery Powered Vacuum Should You Buy? Our top pick among cordless pet vacuums is the Hoover Platinum LiNX stick vacuum. This lightweight, easy-to-use vacuum features Hoover’s WindTunnel technology for improved deep cleaning and pet hair performance. It’s suited for all floor types, and has above-average run time among cordless models. This is a great choice for buyers who want great quality combined with value. If you’re looking for top tier performance, however, the Dyson V8 Absolute stands head and shoulders above other cordless models. The powerful V8 engine behind this stick vacuum delivers all-around superior suction and performance. With HEPA filtration and an array of great attachments, the Absolute is the most versatile and feature-rich cordless vacuum on the market today. Our favorite handheld vac for pet cleanups is the Dyson V7 Trigger. Dyson’s latest hand vacuum comes with an improved battery life and even better suction. If you’re looking for a convenient vacuum you can use all over your house and car, this is it! The motorized brush head is superb, and the whole thing is very well thought-out and executed. Do you want a cordless model to be your primary cleaning tool? Or maybe you’re only looking to supplement a larger corded vacuum? In smaller living spaces, battery-powered stick models can be very practical primary cleaners. They’re also a reasonable, convenient choice for folks in larger homes who like to clean in chunks. Most people use cordless vacuums as supplements to a larger canister or upright model, though. The vast majority don’t offer the runtime to clean a whole house. Even Dyson’s impressive V8 above will only get all the way through smaller homes. Thinking about your specific cleaning goals will also help you decide between handheld cordless models and stick vacs. Handheld models in particular make quick litter, kibble, and fur pickups a breeze. Most stick vacs convert down to a hand vac, but there’s no reason to invest in a big stick if all you want is a hand vac. Whichever approach you take, make sure your new cleaning tool covers all your bases. Cordless vacuums span a huge price range. You can get a cheap one for under $50, but the nicest can easily run you over $500 or more. If you’re going to be using your new battery-powered tool as your primary vac, you should probably invest toward the upper end of that spectrum. If all you need is a convenient dustbuster for small messes, don’t spend more than $200. Be aware that most cordless models won’t give you enough range to get through an entire house. The models that do will cost $500 easily. Looking for more great pet hair vacuums, low prices, and reviews? Check out the best-selling vacuums for pet hair on Amazon!